Just as News Corp. Chairman and CEO Rupert Murdoch was attempting to put scandal behind him and acquire a major media corporation, two more of his former editors were charged with phone hacking while working at his now-shuttered tabloid News of the World. According to Reuters, former deputy editor Neil Wallis and former features editor Jules Stenson have been charged with "conspiracy to intercept voicemails on mobile phones of well-known figures or people close to them." The tabloid's widespread hacking of the voicemails and phones of crime victims, celebrities, politicians, and British royalty in order to find fodder for stories became major international news after it was reported that News of the World had accessed the voicemail of Milly Dowler, a murdered teenager. Murdoch was forced to shutter News of the World in 2011 when the scandal broke, and his company News Corp. has admitted that they have paid out millions in legal fees relating to the scandal. In June, former editor Andy Coulson was found guilty of conspiring to intercept communications at the end of a lengthy trial, though his fellow News of the World editors Rebekah Brooks and Stuart Kuttner were acquitted at the time. Meanwhile, Murdoch's other company, 21st Century Fox (which owns Fox TV and Fox News), is trying to take over Time Warner, which would make it one of the largest media conglomerates in the world. However, his initial offer of $80 billion was rejected, and voices in media have suggested that putting the phone-hacking scandal behind him is key to his ability to expand and maintain his empire. Now that more charges have emerged reminding the media of his past ethical blunders, whether such a risky merger could go forward remains to be seen. The trial of former News Corp. employees for their role in the massive phone hacking scandal has already produced several noteworthy revelations, including the hacking of voicemails from the British royal family, a six figure contract between News Corp. and its phone-hacking private investigator, and more alleged phone hacking victims, including actor Jude Law. This past week's edition of Fox News Watch demonstrated just how toxic Fox News' media reporting has become and just how big a mess newly hired media reporter Howard Kurtz is walking into. On July 3, there was a major development in the investigation into the British tabloid phone hacking scandal and the role of Rupert Murdoch, head of News Corp. and 21st Century Fox (Fox News' newly reorganized parent company after a split from News Corp.). A recording of Murdoch was released in which he railed against the police inquiry into phone hacking and corruption at News Corp. tabloids, waved off the practice of bribing public officials for news tips as "part of the culture of Fleet Street," and promised to support journalists convicted as part of the investigation. It was a major development in one of the biggest media stories of the past few years, and Fox News Watch -- ostensibly a media criticism program -- ignored it, just as it has ignored almost every aspect of the scandal that makes the guy signing the paychecks look bad. The show did, however, find time to cover Fox News Radio host Todd Starnes' brief suspension from Facebook. On July 3, the UK's Channel 4 News broadcast a "secret recording" of Murdoch (obtained by the investigative news website ExaroNews) purportedly captured at a March 2013 meeting between Murdoch and journalists from The Sun, a News Corp. tabloid, who had been arrested as part of the hacking inquiry. On the tape, Murdoch bashes the investigating authorities as "totally incompetent" and says: "But why are the police behaving in this way? It's the biggest inquiry ever, over next to nothing." He promises "total support" to the journalists "even if you're convicted and get six months or whatever," and even suggests their jobs will be secure: "What happens if some of you are proven guilty? What afterwards? I'm not allowed to promise you -- I will promise you continued health support -- but your jobs. I've got to be careful what comes out -- but, frankly, I won't say it, but just trust me." On the heels of its latest quarterly report showing a doubling profits, News Corp. is still reeling from the fallout from the phone hacking scandal as six former News of the World journalists were arrested on February 13 for allegedly intercepting voice mails. Two of those arrested are still employed at News Corp.
News Corp.'s phone-hacking scandal is widening after London police arrested six more former journalists at its now-defunct News of the World tabloid and uncovered a new conspiracy to intercept voice mail. Three men and three women suspected of hacking phone messages in 2005 and 2006 were arrested today and some homes are being searched, the Metropolitan Police Service said in a statement. Two of the people arrested currently work at News Corp.'s other U.K. tabloid, the Sun, Britain's best-selling daily title. News Corp. has settled about 200 civil phone-hacking lawsuits. It faces as many as 100 more as police continue to notify victims, lawyers said at a London court hearing last week. At least 55 journalists have been arrested in the last two years in connection with the phone hacking investigation. These arrests, the latest in a long string of arrests and charges for News Corp. employees, are a reminder that the media conglomerate is far from free of its ethical challenges. According to Bloomberg, lawyer Mark Lewis said, "It comes as no surprise that the lines of investigation are widening ... There is a lot further to go, and ultimately this is a problem that will continue to have reverberations at the top of News Corp."
The ongoing investigation hasn't stopped CEO Rupert Murdoch from exploring new business ventures or racking up billions in profits. News Corp. reported net profits of $2.4 billion in the last three months of 2012, mostly related to gains from cable TV and new channel acquisitions, effectively doubling its profits from the same period in 2011. News Corp. has paid more than $340 million in costs related to the phone hacking scandal. Last year, News Corp. announced plans to split the company into separate publishing and entertainment divisions. On a quarterly earnings call February 6, News Corp. executives said the planned separation was on track "to be completed in approximately one year from the date of announcement." As News Corp. seeks to move on from the phone hacking scandal that rocked the company last year, two former editors of Rupert Murdoch's now-shuttered News of the World have been charged with bribery. Former tabloid editors Rebekah Brooks and Andy Coulson have been accused by British prosecutors of conspiring to pay public officials in exchange for information, according to the Associated Press. Those charges stem from the wide-ranging hacking scandal that has brought down company executives, journalists, and politicians and resulted in a British parliamentary panel declaring Murdoch "not a fit person" to run a major media group, and come as News Corp. attempts to shed the scandal and make new acquisitions. The British criminal investigation began following the revelation that journalists and editors at the British tabloid, The News of the World, had hacked into phones to uncover information in order to report stories. Now, Brooks is being charged with conspiring to pay a Ministry of Defense employee for a series of stories for Murdoch's The Sun tabloid, and Coulson is accused of conspiring to pay officials for access to a royal phone directory. Brooks and Coulson, who have been brought up on other charges associated with the scandal, have repeatedly denied any criminality. Brooks served as an editor of The News of the World, The Sun, and most recently as the CEO of News International, until she resigned in July 2011. She was arrested two days after her resignation. Coulson was an editor at The News of the World until 2007, when he left to become a spokesman for Prime Minister David Cameron. He resigned that position in 2011 amid the hacking scandal. In July 2011, The News of the World shut down. These latest charges of bribery come on the heels of several indications that News Corp. is attempting to move past the scandal; indeed, The New York Times reported November 19 that the company "is starting to look like its old self again" and is looking to make acquisitions after having "been on its heels for more than a year because of the phone hacking scandal in Britain." Days after former News International CEO Rebekah Brooks and other journalists connected to News Corp were formally charged in relation to the phone hacking case, more journalists were arrested regarding allegations that a News Corp newspaper used stolen phones. A second journalist at News Corp. (NWSA)'s Sun tabloid was arrested on suspicion of handling stolen goods as part of a police probe into allegations that the newspaper used data from mobile phones that were ripped off. Police arrested a 37-year-old journalist today, the Metropolitan Police Service said in a statement. That follows the arrest of a 51-year-old man yesterday. Both men worked at the Sun, according to an official at News Corp.'s U.K. unit, who asked not to be identified, citing company policy. The alleged thefts are the latest accusation against News Corp.'s U.K. publishing business, News International, whose reporters and editors have been accused of hacking into mobile- phone voice mails and e-mails, bribing public officials and disrupting police investigations. Sue Akers, the MPS deputy assistant commissioner, said last week that officers had discovered that News International journalists had information that appeared to be from stolen phones. About 60 people have been arrested since the police investigations began last year. Eight former News Corp. journalists were charged last week with conspiring to intercept voice mail, including former News International Chief Executive Officer Rebekah Brooks and Andy Coulson, an ex-lead tabloid editor who later became an adviser to U.K. Prime Minister David Cameron. News Corp. (NWSA)'s British publishing unit asked a judge to keep secret a series of new claims being made by victims of phone hacking at its News of the World tabloid in preparation for a group trial scheduled for February. The details of the allegations, which could be used to seek punitive damages, should be kept from the public unless they are approved at a Sept. 7 hearing and added to the victims' so- called generic claims, Judge Geoffrey Vos said today in London. The claims outline "generalized activities which we think are unsustainable" if challenged, Michael Silverleaf, the lawyer for the News International unit, said at the hearing. "They may change the approach we are taking" to the case. News Corp., the New York-based company controlled by Rupert Murdoch, is trying to move on from the scandal after the civil case and a parallel criminal probe that began last year revealed a cover up and led to the closure of the tabloid and the arrests of more than 60 people, including another journalist today. Investigator: News Corp Phone Hacking May Have Just Been "Tip Of The Iceberg"
Last week, Rupert Murdoch resigned from a number of British newspaper boards that oversee The Sun, The Times, and The Sunday Times. Today, the senior police officer overseeing the investigation told the Leveson committee that the investigation spawned by phone hacking at News of the World is now investigating information obtained from stolen cellphones and significant payoffs to public officials. The phone hacking investigation of Rupert Murdoch's tabloid newspapers in Britain has broadened to include allegations that information was obtained from stolen cellphones, significant payoffs were made to public officials, and "medical, banking and other personal records" were illegally accessed, the senior police officer in charge of the operations told a judicial inquiry Monday. The officer, Deputy Assistant Commissioner Sue Akers of Scotland Yard, gave the most detailed assessment yet of the three investigations prompted by allegations in 2009 that The News of the World tabloid had illegally intercepted voice mail messages on an industrial scale. The newspaper was closed last summer under the weight of public outrage. But detectives now suspect a swath of related illegal activities, Ms. Akers told the panel headed by Lord Justice Sir Brian Leveson. The police are aware of information that Mr. Murdoch's papers obtained from two stolen cellphones, she said. One was in Manchester, in northern England, and the other in southwest London. She said that it seemed that one of thee phones had "been examined with a view to breaking its security code," in order to gain access to its contents. The authorities are trying to establish whether the thefts were isolated incidents, or "the tip of the iceberg," she said. Allegations like these are why Murdoch faces a shareholder revolt over the "lax ethical culture and lack of effective board oversight" at News Corp. Turns out internal Fox News talking points about what not to discuss on the air might be just as influential as the guidelines that coach hosts on which stories to push each day. What else could explain the fact that it's been 52 weeks since Rupert Murdoch's News Corp. phone hacking scandal broke big, yet Sean Hannity has never addressed the story on his show, according to a search of Nexis. The O'Reilly Factor and Hannity have aired more than 500 hours of programming in the last year, but set aside just a few minutes for the hacking story. This week marks the one-year anniversary of the shocking Guardian scoop about how Murdoch's News of The World tabloid hacked into the voicemails of an abducted schoolgirl who was later found murdered. The ghoulish revelation catapulted the News Corp.'s long-simmering British phone hacking scandal into the news stratosphere and uncorked a twelve-month ride that has been brutal for CEO Murdoch at every turn, as allegations have tumbled out about rampant phone hacking and the paying off of public officials. And there is no end in sight to his woes. Since that scoop, the hacking story has been arguably the biggest media business news story of the year, as the controversy has completely roiled Rupert Murdoch's company, causing him to close an entire newspaper and jettison top lieutenants (including his own son) who became tainted by the scandal. Government investigations were launched to determine whether News Corp. employees had hacked phones, computers and emails. In May, a scathing U.K. parliamentary report found Murdoch to be "not a fit person" to run a major media company. Just last month Murdoch was forced to reorganize his entire News Corp. media empire in an effort to "quarantine" his now-toxic UK newspaper properties, as one Wall Street analyst put it. Meaning, the scandal continues to reverberate throughout Murdoch's world, and deep into the heart of British politics. To date, it stands as one of the most sweeping and damaging corporate media eruptions in modern times. In other words, the scandal nicely captures everything that's wrong with the culture of corruption that Murdoch has fermented at his partisan media titles. And so of course that's the reason Hannity and O'Reilly, who promote themselves as tough talkers willing to confront uncomfortable truths, are too terrified to mention the story while the cameras are on even though it's a story that intersects at the usual Fox sweet spot of media and politics. Unable to mount even a feeble defense on Murdoch's behalf and the rampant lawbreaking that occurred in his name, Hannity and O'Reilly have simply played dumb on an epic scale, turning a blind eye to a story that has ravished their employer and permanently scared his reputation. We usually think of Fox as a propaganda outlet because of the false stories and smears it relentlessly pushes. But as Murdoch discovered during his most difficult year, with Hannity and O'Reilly, sometimes propagandists prove their worth by not covering stories that embarrass the boss. Once among the most powerful figures in the British media, with close contacts stretching from her boss, Rupert Murdoch, to her friend, David Cameron, Rebekah Brooks, the former head of Mr. Murdoch's British newspaper empire, was told by prosecutors on Tuesday that she, her husband and four others will face charges of conspiring to pervert the course of justice in the hacking scandal that has burrowed into public life here. It was the first time the charges have been formulated since police reopened inquiries into the affair in January 2011 and intensified their questioning six months later. The development brought the scandal to a watershed between criminal investigations, which have resulted in around 50 people being arrested and then set free on bail, and the prospect of trial before robed judges. The six were accused variously of concealing documents, computers and archive material from officers investigating the scandal last July. 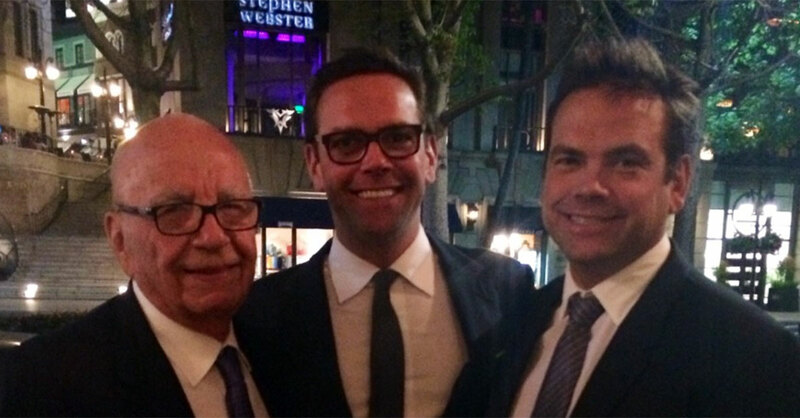 Murdoch Admits Phone Hacking "Cover-Up"